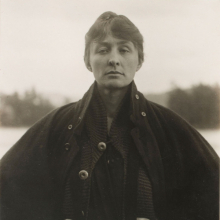 Following in the footsteps of artists such as James McNeill Whistler and Oscar Wilde, Stieglitz wore a full-length Loden cape with distinctive round buttons as his everyday “art dress.” In their early years together, O’Keeffe liked to dress up in his cape for their photo sessions. He enjoyed posing her in ways that made the form of the cape appear as a solid pedestal supporting her head. 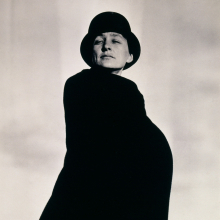 O’Keeffe had her very first museum exhibition, held here at the Brooklyn Museum, in 1927. 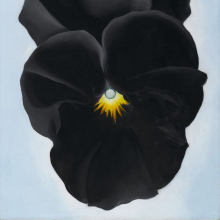 Black Pansy and Forget-Me-Nots (1926) was borrowed for the exhibition from a private collector, and at the conclusion of the show, O’Keeffe encouraged the lender to donate it to the Brooklyn Museum. It is one of fourteen O’Keeffes in the collection; six of the works were bequeathed to the Museum by the artist herself. The decoration at the center of this blouse recalls O’Keeffe’s paintings of crinkly-edged autumn leaves and corrugated seashells. The blouse and its ornament are shaped by tiny pintucks that look like the veins of a leaf. 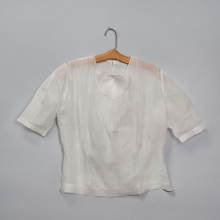 A conscientious mender of clothes she liked to wear, O’Keeffe meticulously patched the back of this blouse. O’Keeffe’s wrap dresses, which she often wore in layers or with a light blouse underneath, shaped her body into the form of a pyramid—lightly fitted above the waist and flared out below the belt. Like a kimono, they wrapped around her, but their fitted sleeves allowed her arms to move freely. The wrap dress was not only comfortable and easy to slip on and off; its simplicity allowed her to accessorize according to her own style, with one of her belts, her Calder pin, scarfs, or hats. She liked this design so much that it became something of a uniform for the next twenty years. She took a well-worn one apart and made a paper pattern from it so that local seamstresses could re-create it for her in different colors and materials. 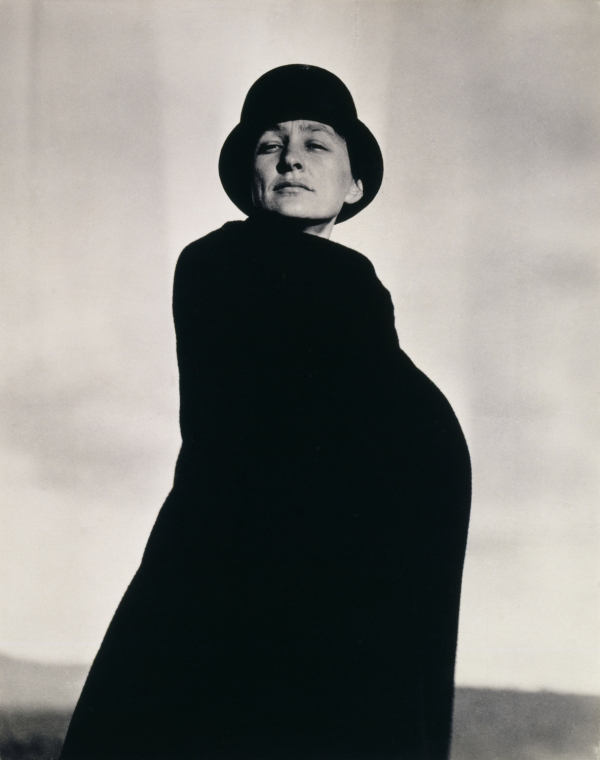 O’Keeffe bought her first wrap dresses from Neiman Marcus in Texas in the late 1950s. They were very basic: made of cotton, single-colored, unlined, no buttons or zippers, only a matching belt. The design originated in light cover-ups that runway models wore behind the scenes; when Neiman Marcus introduced the “Model’s Smock” as a casual day dress, it sold extremely well. For this formal portrait, the last anyone would make of her, the ninety-seven-year-old artist came up with a hybrid outfit fusing male with female and East with West. 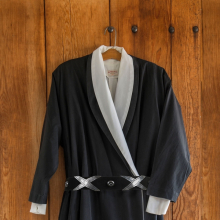 She put on a heavy, Japanese men’s padded winter robe and topped it off with her well-worn vaquero hat. She added something white to emphasize the V-neck and her silver Alexander Calder pin to hold the front together. Weber framed her within the calligraphic circles of her own abstract sculpture that echo the spiral letter O of her OK pin. 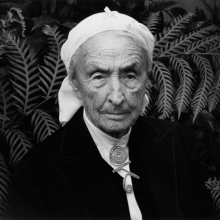 In this costume, O’Keeffe looks away, a dignified, seemingly genderless elder. 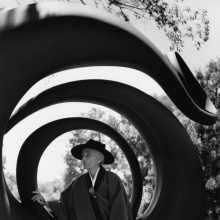 In 1981, O’Keeffe visited Ansel Adams in California for the last time. They were very dear friends and had known one another for over fifty years. 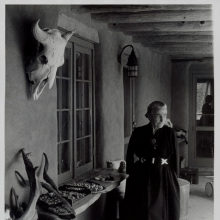 He unfailingly got her to look directly at him and his camera for portraits that characteristically are straightforward and “natural,” without the mythos that attended photographs of her as a solitary and remote figure of the desert. Knize closed in New York in 1974, so O’Keeffe’s final suit purchase was from Emsley, another high-end men’s tailor in the city. 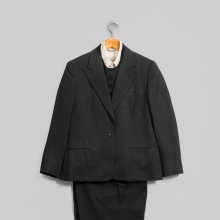 In 1983, at the age of ninety-six, she ordered a black suit that included matching pants, vest, skirt, and jacket. Her wearing of pants with a matching jacket conformed to contemporary feminist practices that helped move women of all ages to adopt the elegance, comfort, and politics of pants. Her pant suits were another iteration of an androgynous look she had embraced her entire life. 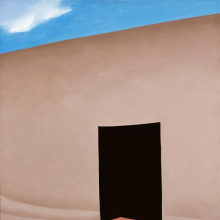 In the 1950s, as American abstraction began to get international attention, O’Keeffe started to paint large images of the black door, wall, and paving stones of her Abiquiu patio at different times of day and in different seasons. Some were quite abstracted, like the version nearby, while others like this one were more grounded in nature. She also took photographs of the door, two of which can be seen elsewhere in this gallery. It became a serial motif for her and linked her practice in New Mexico with that that of younger New York abstract painters, such as Mark Rothko and Ellsworth Kelly, who created multiple works around a repeated form. That wall with a door in it was something I had to have. It took me ten years to get it—three more years to fix the house so I could live in it—and after that the wall with a door was painted many times. Georgia O’Keeffe: Living Modern is organized by guest curator Wanda M. Corn, Robert and Ruth Halperin Professor Emerita in Art History, Stanford University, and coordinated by Lisa Small, Curator of European Painting and Sculpture, Brooklyn Museum. Lead sponsorship for this exhibition is provided by the Calvin Klein Family Foundation. Generous support is also provided by Anne Klein, Bank of America, the Helene Zucker Seeman Memorial Exhibition Fund, Christie's, Almine Rech Gallery, and the Alturas Foundation. The accompanying book is supported by the Wyeth Foundation for American Art and the Carl & Marilynn Thoma Art Foundation and is published by the Brooklyn Museum in association with DelMonico Books • Prestel. We are grateful to the Georgia O'Keeffe Museum, whose collaborative participation made this exhibition possible. Georgia O’Keeffe: Living Modern is part of A Year of Yes: Reimagining Feminism at the Brooklyn Museum, a yearlong series of exhibitions celebrating the 10th anniversary of the Elizabeth A. Sackler Center for Feminist Art.